What should you do when your company makes changes? Change happens. Change is never comfortable, but it always happens. The leaders who go to the top in network marketing accept change, good or bad, as part of life. They make decisions, then get on with life. They make the best decision they can, then live with it. They don’t spend endless hours second-guessing their decisions. Think of it this way. You could try to manipulate changes into perfect solutions. Well, we know that will never happen in our non-perfect world. You would be busy for the rest of your life manipulating a change from 10 years ago. So accept change. Make a decision. Then get on with building your network marketing business. This famous basketball coach simply asked his players to perform to the best of their ability. He told them not to worry about the opposing players because they could only control themselves. If they played hard, the outcome of the game would normally be in their favor. They could not control if the other team had a lucky game. It’s the same in network marketing. Don’t worry about the outside influences that you cannot control. Instead, worry about what you can control — your own personal performance. If you commit to performing to the best of your ability, your bonus checks will take care of themselves. Do you have low-level or high-level communications? Many distributors communicate at the lower levels of communication. To improve our sponsoring, we should try to communicate at the higher levels. 1. Email. Hard to make any kind of connection in an email. 2. A physical letter. Great chance to write something in the margins or to highlight a phrase. 3. A phone call. Ooooh, much better. You get two-way communication, feedback, and can address the prospects’ questions instantly. 4. A video call. You can get feedback and see the expression on your prospects’ faces. You can even watch them roll their eyes and fall asleep. 5. Person-to-person. Total body language feedback and more. But the very highest level of communication? 6. Person-to-person over food. No one ever gets mad at you over food. Meet someone for lunch or over coffee to insure great, friendly presentations. How to get “inside” your prospects’ minds. Ask great questions and then wait for your prospects to really think about the consequences. Who do you think really cares how much is in your savings account 10 years from now? How long will you receive a salary after you leave your job? Will your company still benefit from your work after you leave? If you wanted to stay home with your family, have you thought of other ways to get regular paychecks? Wouldn’t it be nice to have an extra monthly check that covers all your car payments? What to do before you look for great prospects. Most of the questions I get have to do with who to talk to and how to talk to them. Searching for good niches of prospects is secondary. How to talk to prospects is primary. No matter how good the prospect is, we can say the wrong words. I had years of experience doing just that. Too many distributors try to fix their bad choice of words by finding new and better prospects to ruin. Not exactly a good plan. Better words means you can capture more potential prospects. It’s just that simple. Why we ruin 3 out of 4 prospects. Each personality type sees the world differently. That means we have to talk to each of the personality types differently. You are one personality type. It is easy for you to talk to others who have the same personality type, but you instantly ruin the prospects who aren’t like you. Here is the payoff. If you can learn how to talk to the other three personality types, you would sell or enroll four times as many people! So this skill is worth learning. What not to say to prospects. Okay, that’s not exactly what we say, but that may be what our prospect hears. Most prospects are followers. They don’t want to follow someone who is not committed to getting to their destination. They don’t want to waste their time following someone who is going to turn back. We must assure our prospect that we will do whatever it takes to get to our destination. That will make the decision to follow us easier for our prospect. What to say to prospects. This statement will help open up your prospect’s mind, so your prospect can lean forward, and look for reasons why your opportunity will work for him. Use presentations for training, not closing. During a conference training call, I only had 30 minutes to talk, just enough time to irritate the listeners by telling them that their presentations were useless. They protested by saying their prospects were different. Their prospects would make the final decision to join their business based upon … (and this is funny) … FACTS! * “We are the 17th largest MLM company in the world.” – Gee, if size mattered, why wouldn’t the prospect join one of the 16 companies larger than you? * “We are the 37th fastest growing company in the INC 500 list.” – Wow. Why should I take a slow grower like you when I could pick an even faster grower? I’ve got 36 better candidates to choose from. * “Our product is patented.” – Let’s see. About a few million other products are patented, too. And most patents require an investment of a couple hundred dollars to get the paperwork. Not too impressive. * “We pay out a full 50% in our compensation plan.” – Well, if I should make a decision based upon percentage payout of a compensation plan, then maybe I should join one of the hundreds of programs that pay out more than 50%. * “We are a 17-year-old debt-free company.” – If length of time was the decision factor, shouldn’t I join a company that is older than yours? And wouldn’t debt-free mean that your accounting department didn’t know how to use leverage to lower its costs? Ouch. * “Our chief scientist taught at a prestigious medical school.” – This sounds more like, “My scientist can beat up your scientist.” So should I join a company who has a better scientist who got some cool awards, or maybe a Nobel Prize? * “Our management team has 84 years of combined networking experience.” – Well, I have 60 years of dieting experience, and that doesn’t make me thin. So are you telling me that I should join a different company who has a management team with more than 84 years’ networking experience? * “Our secret ingredient has more antioxidants than their secret ingredient.” – So if I join your company, and I find another company that has 2 more units of antioxidants, then I will have to quit your company and join them? Okay, starting to see a pattern yet? I’m sure you get the point. It is not the facts in our presentation that affect our prospects’ decisions. Stop using presentations to get prospects to make decisions. Instead, learn the skills of how to close and how to do our business instead of living in some fantasy world where we think that facts make a difference. So, how mean can your relatives be? So how mean can your relatives be? Mean. Real mean. And depressing, negative, and small-minded. That’s why my friend, Bob, joined network marketing. He was tired of socializing with relatives and friends who discussed and reviewed every negative story on their 24-hour news channel. Bob wanted a new group of people to associate with. He looked for positive people who were moving ahead in their lives. Hey, if you have to live, why not live with positive and friendly people? Sound like some of your friends? Let me tell you about one of my friends, Alisa. She is different. For her, network marketing is all about self-development. Alisa spent 18 years of schooling memorizing facts and never once learned about the power and satisfaction of self-improvement. Now she starts every morning with 15 minutes of positive reading and her days are filled with positive experiences that she creates. So many networkers have improved and changed their personal lives with the power of self-improvement. They read books, listen to CDs, and attend workshops while their high school classmates watch reruns of the television show, Friends. Guess who is getting more out of life? I bet you have a friend or two who repeats this complaint every day. For them, network marketing provides enough income to stay at home with the children, and create a real family life. You don’t have to earn a lot of money in network marketing to drastically change your life. So why don’t more people use network marketing to replace their jobs and create the lives they want? Well, they just don’t know. All of their network marketing friends are keeping it “top secret.” Hmmm, there is a lesson there for us. Yes, some people take their network marketing business to the top level. That’s okay, too. I do know that when you earn more, you can give more. That should be a good enough reason for people to earn more than they can spend. And network marketing provides that income and freedom for many people. That’s what makes network marketing attractive to people who desperately want to make a big change in their lives. 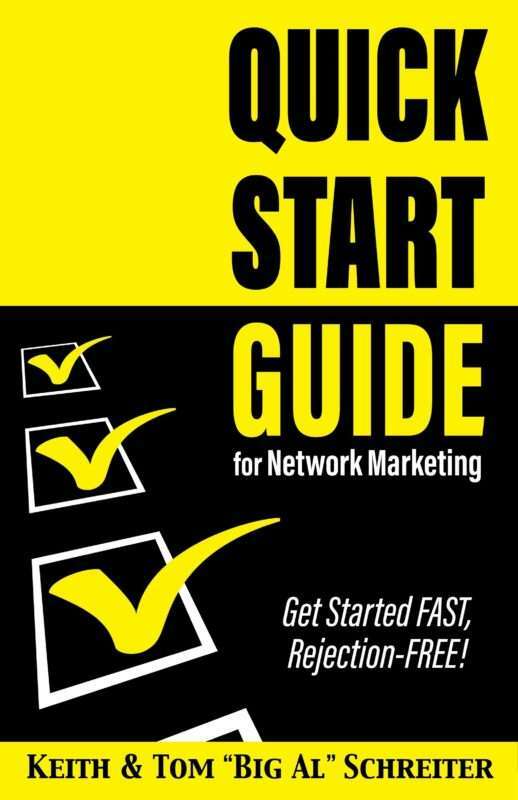 So what is right with network marketing? We provide choices and opportunities for people. They can pick and choose what they want out of network marketing. Yes, the money is fine, and you can buy some happiness with money. But life is wonderful if you enjoy what you are doing.